Coffee is roasted in a coffee roaster. 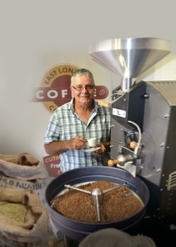 There are big and small roasters, from 1 kg up to around 70 kg per batch. Irrespective of the size, each will essentially consist of a metal container (usually a drum) which is pre-heated using a gas or electricity. Green, un-roasted or ‘raw’ coffee beans are inserted into the drum once it has been preheated to a temperature set by the roaster himself. The bean gradually get hotter and hotter until, sometime between eight and nine minutes, they reach a stage called the first-crack which is where the real development starts. A distinct crack is heard after which two key chemical reactions take place, the Mailard and the caramelization process. The length of this development phase depends on many factors including the hardness of the bean and the environmental temperature. The roaster will drop the beans into the cooling tray once they reach the required development time and roast type such as light; medium or dark. Unlike many large commercial roasters, speciality roaster who are seeking to get the best taste from each individual bean, will rarely roast further than the initial stages of the first crack which usually occurs between 13 and 15 minutes from the start of the roast. Green beans are hard, a little like dried and split peas, the type used for soup. During the roast these expel liquids and expand in size to approximately double the size and 15-20% less in weight. A short home-made video on how we roast coffee. #Prime temperature: The temperature of the drum when inserting the beans. #Environmental temperature: The air temperature surrounding the beans. #Rate of Rise: The rate the bean temperature rises during the roast. #First crack: The time of first crack. #Stretching the roast: How the roaster endeavours to lengthen the development phase. #Drop temperature: When to drop in order to meet roast requirements. #Cooling: A fan induced rapid cooling process. #Chemical reaction: Understanding when, why and how these occur. #Flavour development: How to reach full inner and outer bean development to ensure the best aroma and fullest flavour.